If you are running a cutting edge version of Google Chrome, Canary for example, you may have noticed the new "You" menu at the top right of the browser. As it stands, it will eventually be moved to other versions of the browser including beta and stable versions. So what is it for? It is a menu for Google Chrome's profile manager. It enables you to create multiple profiles, for instance for different users who share the same computer or activity-based, and also to run Chrome using a guest profile. The profile can be linked to a Google Account which in turn powers Chrome's data synchronization feature. Once you sign in, your bookmarks, browsing history and other data is synced across all devices. 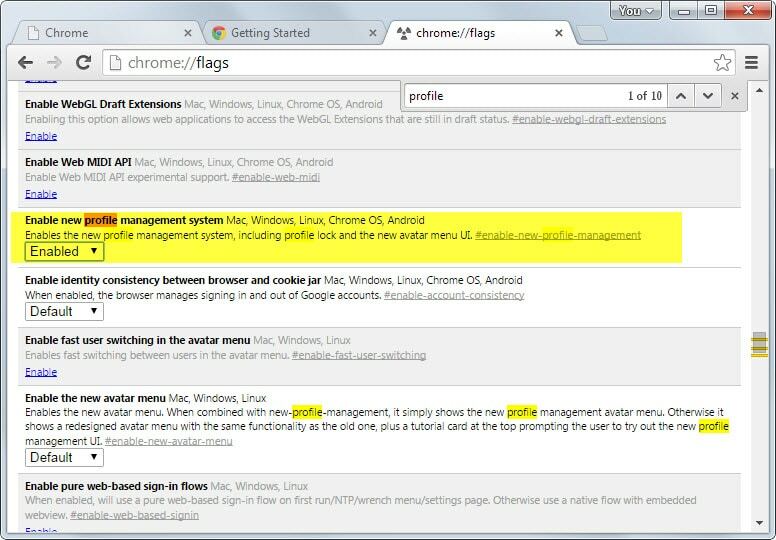 Chrome's user management can be useful in this regard, but not to all users of the browser. If you are the only user for example, there is little need to use it or display it at all times in the interface. And if you use Chrome only on a single computer, you don't need to enable data synchronization unless you want it backed up in the cloud on Google servers as well. Update: Google has made several modifications to the profile icon displayed in the Chrome browser in recent time. The method listed above won't remove the profile icon in the top right corner of the Chrome window anymore. The only option right now to get rid of it completely is to launch Chrome with the parameter --disable-new-avatar-menu. Update 2: It appears that Google has removed the option to remove the profile menu in the browser in Chrome 47. There seems to be no option currently to remove it from the browser. Type chrome://flags/ in the browser's address bar and hit enter. Tap on the F3 key and search for Enable new profile management system. Change its value to disabled using the menu. Search for Enable the new avatar menu. Change its value to disabled as well. The "You" menu is removed from the browser after the restart so that it is no longer displayed in the interface. If you want to enable it again at any time, repeat the process described above but change the value to enabled instead. Disabling the menu in Chrome has no impact on the synchronization feature of the browser. You can still open this page to sign in to your Google Account to sync browser settings with the cloud and other devices. It is furthermore still possible to manage users. You can do so by loading chrome://settings/. You find a users group on the settings page which you can use to add or delete users in Chrome. The permanent display of profiles in Chrome is a bad design decision. While some users may find it useful as it speeds up profile switching, others, and that is likely the majority of users, may dislike it because they don't use it at all or only rarely. For now, it is possible to disable the menu. We have seen in the past however that options to disable a new feature are removed after some time by Google or replaced by other functionality. If that is the case, we will update the guide to reflect this. Google Chrome displays a new "You" menu at the top right. Find out how to remove it from the browser. I manage four profiles with almost daily regularity, so I thought I would check this out. At this point it adds additional, totally unnecessary time and action to switching between profiles. Perhaps someone will be able to explain how this could be helpful in any way, but from my very brief use testing it out, I can’t find any purpose for this change at all. Hope they do turn it off by default. This caused me weird results with settings migration from one system to another. Mainly multiple “Home” pages opening upon Chrome loading. I never had a you menu before on my google chrome i don’t know how i got it or where did it come from when i check out about google chrome is not updated i go to regedit push the button on it go to policy go to update check on one of the updates change 0 into 1 then x it the window and then chrome is updated. Here we are: Chrome 44 forces now to display this menu. New profile flag is enabled, even if you set it to “disabled” (have they forgotten to remove it from the flags page? ); and the new avatar menu flag has disappeared. EDIT: actually, there is a (temporary, for sure) new way for getting rid of this button: go to the Chrome’s shorcut properties (on Windows, at least) and add a “–disable-new-avatar-menu” parameter at the end of the command line to the executable. Restart Chrome and it’s working until they remove it again. This one worked for me, the EDIT part. Thanks. It’s back and I can no longer disable that annoying top-right icon which I keep clicking and don’t want. New fix anyone? Yup it’s back as annoying triangle thingie. There is no longer a ‘disable avatar menu’ option in the flags page, and the profile manager being set to disabled no longer works. Why would they make this a feature you can’t turn off. Most people don’t need or want it. Mine just reappeared. How do i use this ‘–disable-new-avatar-menu’ thing? You need to add it to the shortcut that starts Chrome. On Windows 7 and up, you right-click on Chrome in the Taskbar, then right-click again on Chrome in the menu that opens. Select properties, and add the command to the Target field. Make sure there is a space between it and the string that was in there before. Martin, could you be so kind as to provide step-by-step on what to enter after this? Note that this line won’t work for you as your username and Chrome version is different. thank you! with this last update, none of the other fixes worked. are there any drawbacks/ negatives to taking out the ‘avatar menu’? I have not experienced any but I’m using Chrome as a single user only. Fantastic! It worked! Martin, you are a genius. Thank you! start chrome, not icon, in updates chrome cant start update.